I'm trying to deploy an OPNSense VM on KVM (RHEL 7.2). How can I enable debug logs and increase verbosity for the boot? I tried with vSphere 5.5 and VirtualBox and I was able to boot and install OPNSense correctly. Though even if I exported the VM's disk (either in VMDK or VDI format) and converted it in QCOW2 (or RAW), the VM does not boot at all. I might be mistaken, but didn't this have something to do with the video part in vSphere/VB? There should be some topics regarding this already. 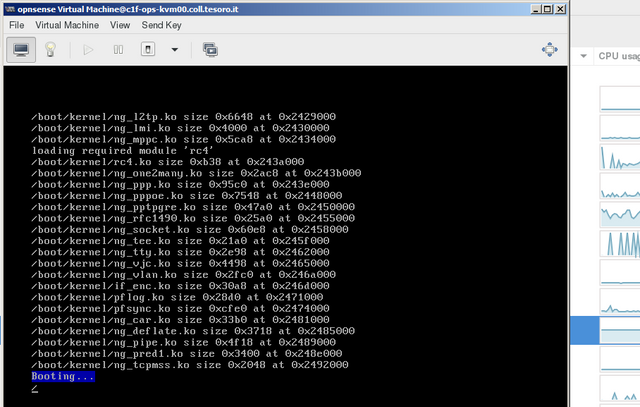 I tested the same image on vSphere, VirtualBox and KVM. I was able to start OPNSense without problems on vSphere and VirtualBox but the boot procedure hangs on KVM. I also tried to export a working instance of OPNSense from vSphere to KVM in OVA format, but he issue is the same and the System does not boot. Is the Disk Controller set to IDE in KVM? Seems I somehow misread and mixed things up. I read you tried it in vSphere and VB, and got it to work in KVM. I can try this on Fedora/KVM to see if the issue is the same there. There is a chance that it's not stuck, but configured incorrectly for serial/console so it boots but you don't see it. What are you options WRT console? Please consider that i performed my tests in OpenStack, based on RHEL 7.3 hosts. I also tried to boot OPNSense on a RHEL 7.2 KVM hypervisor but the boot process hangs in both cases. I tried to boot different FreeBSD 11 images (QCOW2, CDROM ISO and USB Mem-Stick image) and I did not manage to boot in all the cases. Are you suggesting me to configure the SERIAL (no VGA) image and try to boot from this source? I'm also getting it freeze at this point, however my setup is APU2C4 with a mSATA(?) 32GG drive. The box is about 14 months old, started with OPNsense, and has had a good few upgrades applied. I've tried clean installing it with OPNsense-17.1.4-OpenSSL-serial-amd64.img which boots from USB stick, installs, but then if I reboot, same probem "Booting...." and freezes. Anyone any ideas? I'm going to leave it on a memtest over night, just to rule out any issues there. OK so sorry to have to say this... it did work, when I actually bothered to login as installer and actually INSTALL OPNsense... please excuse me. Clean installed, restored config, updated to latest patches, all good. Ok, glad to know it worked for you. I think the problem is related to emulated VGA display. Well yeah I'm very thankful that I got it up and running again. I had to put a Ubiquiti USG in a hurry on my LAN, and I immediately missed my OPNsense. I was near purchasing a new APU2C4 mobo. Still unsure as to what was causing it to showing and freeze at "Booting...". All I know is the box went through a number of upgrades over it's 13 months of life. Might be worth you checking with the KVM guys in #kvm on freenode about your issue? So, are you suggesting me to ask for support on IRC?